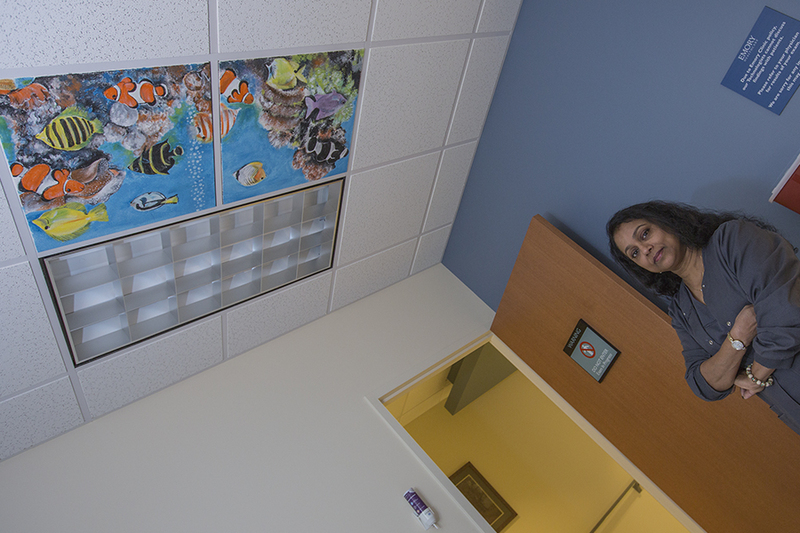 My idea for the Employee Engagement Committee was to paint the ceiling tiles, and to get our staff involved in something fun and creative,” says Veena, who’s been with Emory for nineteen years. When the technologist says, “Okay, now just relax,” the patient searches overhead, looking for something to distract her, to help her relax. She tries to see patterns in the shadows thrown across the white ceiling tiles while the technologist positions her for imaging, but can’t. She shuts her eyes. This problem wouldn’t stop bothering Veena Rajeevan, radiology supervisor for General Diagnostic Radiology/Bone Density at Winship Cancer Institute (WCI). How could she make the imaging environment less stressful? About six months ago, the solution hit her: paint. She calls it Art for Care. Facilities Management gives her the ceiling tiles, which she paints during her lunch breaks. Each tile takes 20-30 minutes to complete. The work is as therapeutic for her as it is for patients. So far, Veena has painted about thirty tiles. Patients and radiology colleagues love them so much, they asked for painted tiles for CT, ultrasound, and MRI. Now when radiology patients look up, they find comfort in the bright, light art, and for a while, the shadows disappear. If you’d like to help with Art for Care, please contact Veena Rajeevan at 404-778-3573.